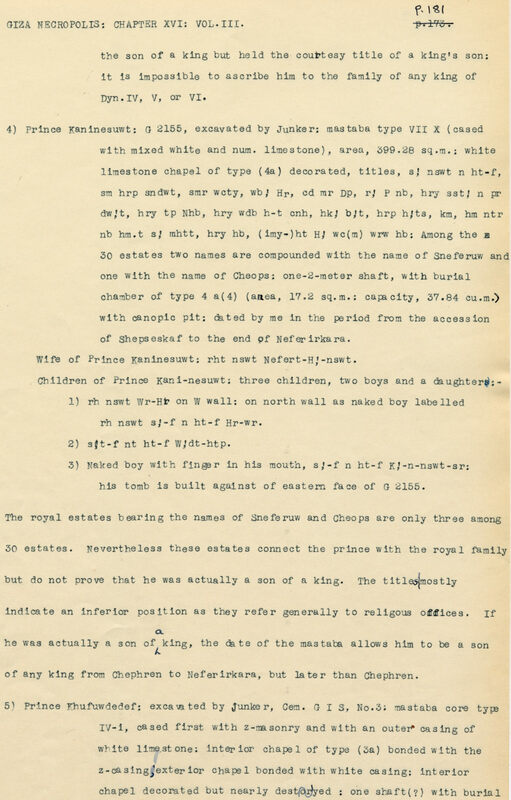 *The original, paper version of this page in “Chapter 16: The Royal Family of Dynasty Four” can be found in archival box L01 in the Egyptian Section archives of the Museum of Fine Arts, Boston. Remarks Owner of G 2155. Father of Kaninisut [II] (owner of G 2156). Chapel entrance north and south door jambs, and north and south false doors inscribed for Kaninisut; also appears in chapel relief (west wall, between false doors, north wall, and east wall, over chapel entrance); chapel (KHM Vienna ÄS 8006) found in situ in G 2155. Remarks Owner of Mastaba IV. Appears in chapel relief (south wall, and name partially preserved on fragment from elsewhere in chapel), identified as [Hrj-wDbw nswt] master of royal reversion-offerings; south wall in situ in Mastaba IV interior chapel. Red granite sarcophagus (Cairo JE 53149) inscribed for Khufudjedef, identified as [sA nswt] king's son; found in situ in Mastaba IV shaft S 68 burial chamber. Remarks Wife of Kaninisut [I] (owner of G 2155). Appears in chapel relief, west wall (between false doors, standing behind her husband, and panel of relief north of north false door, top register [facing right]); chapel (KHM Vienna ÄS 8006) found in situ in G 2155.